Do you have uncomfortable rooms in your home, an inefficient HVAC system, or high heating and cooling bills? You're not alone! At Dr. Energy Saver, we've dealt with all types of home comfort and energy issues over the years, and we know how to give your home a quality solution. 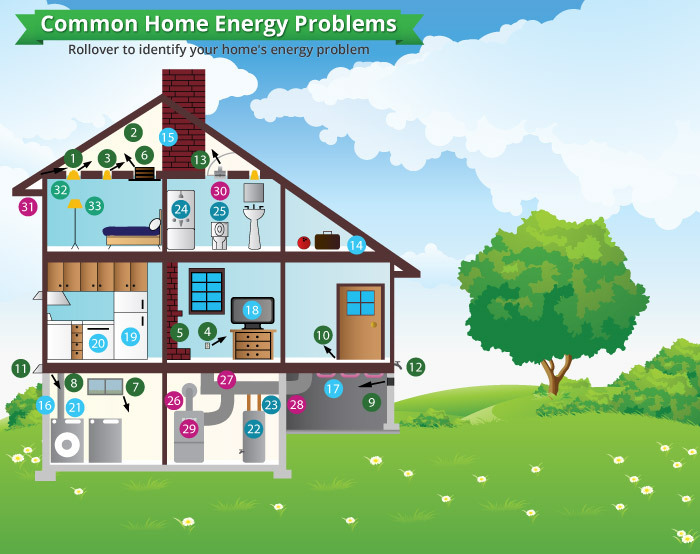 Take a look at some of the most common symptoms of home energy problems below and then give us a call to get a complete home energy audit! We specialize in providing energy solutions that make your home more comfortable and efficient. Uncomfortably cold or hot rooms: If you have rooms in your house that are always too cold in the winter and too hot in the summer, you likely have an issue with your home's insulation. A home energy audit can identify the areas where you're losing energy. Uneven temperatures in the home: Many homes have that one room that doesn't ever seem to be the same temperature as the rest of the house. If you have this problem, your ductwork and insulation are the likely culprits. We can help you determine what air sealing and insulation upgrades are needed. Drafts around windows and doors: If it feels unusually cold around your windows or doors, you may need replacements. Energy efficient windows and doors with upgraded weatherstripping will eliminate drafts in your home. Cold floors: Cold floors above the basement, crawl space, or garage are usually a symptom of insuffient or missing insulation. We can inspect your home and provide the insulation solutions you need to eliminate cold floors. Ice dams: A buildup of ice along the edge of your roof means that heat is leaking into your attic from the living space below. Snow melts high up on the roof, and the resulting water freezes along the colder eaves, causing a thick ice layer to form - damaging both your roof and gutters, while also causing water leaks. Upgrading attic insulation can prevent ice dams. If you have any of the problems listed above or any other home energy issue, Dr. Energy Saver can help. We offer complete home energy audits to identify the cause of uncomfortable rooms and energy waste in your home, allowing us to provide a customized solution that fits your needs. Contact us today to get started with an inspection and estimate from your local Dr. Energy Saver dealer!